The iPhone and iPad have a little known text-to-speech functionality that will verbally spell out a selected word or string for you. This great feature is useful for many obvious reasons, whether for educational purposes, or perhaps you can’t quite make out if what you’re reading on the iPad or iPhone screen is supposed to be an uppercase O or a zero 0, or any other situation where you can imagine it’s useful to have your iOS device speak aloud the spelling of a word or selected item. 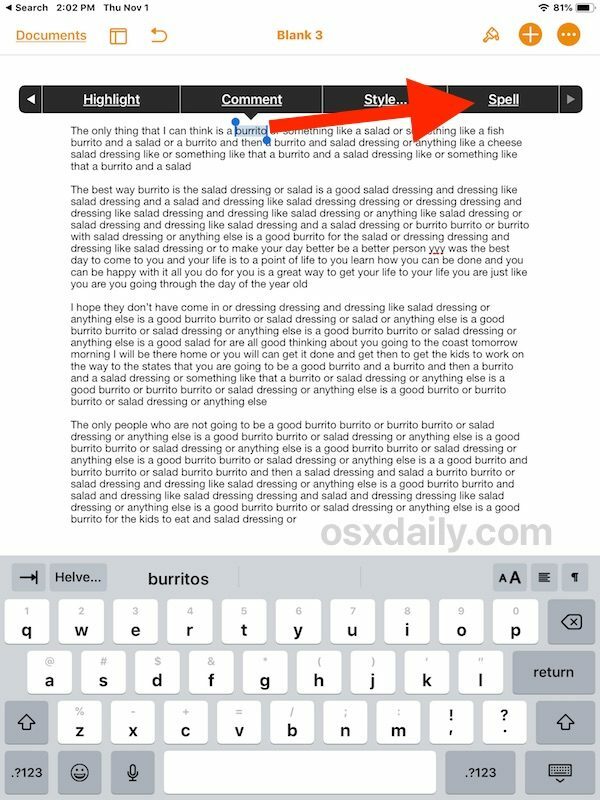 This great trick literally spells out a word that is selected, for example if you selected the word “burrito”, then iOS will spell out b-u-r-r-i-t-o by annunciating each individual letter in sequential order, making this a completely different spelling feature from auto-correct or the general text to speech and Speak Screen functions in iOS. You can spell individual words, text strings, or even numerical sequences, as long as you can select the word or string in iOS, the “Spell” option should be available on any modern iPhone or iPad, and when chosen it will spell out the word or string. If you’re reading this very web page on an iOS device you can try it out yourself simply by tapping and holding on any single word on this page, then selecting the “Spell” option from the pop-up menu that shows on screen. Remember, if you’re using an app like Pages with a lot of pop-up menu options, you’ll need to tap on the arrow button to show the ‘Spell’ option in the menu. Note: if this feature is not available to you, then you will need to have “Speak Selection” enabled in iOS Settings to have this feature available to you. Go “Settings” then to “General” > “Accessibility” > and Speech, choosing to enable “Speak Selection” in those settings. This enables many helpful features, including general Text-to-Speech capabilities, and allowing for tricks like having your iPhone or iPad reading your emails to you, or Siri reading the iOS screen to you, and much more. This spelling aloud capability is part of the iOS text to speech functions, but rather than speaking aloud a word, it spells out the word or selected string. This isn’t really meant to be a typographical error correction method, as that’s what autocorrect and the QuickType keyboard bar are for, but it certainly can serve that function too if you need it to, particularly if you can’t quite see what the spelling of a word is on screen, and of course assuming you know how to properly spell the word to begin with. The text-to-speech capabilities on the iPhone and iPad are really great with a lot of hidden tricks available. Two of my personal favorite capabilities are using the iOS text-to-speech abilities to have Siri read the screen to you in iOS, or to enable Speak Screen to have iOS read entire articles to you with a gesture. If the general topic of text-to-speech interests you then check out archives on that subject here, where text to speech tips for iOS and MacOS are covered. 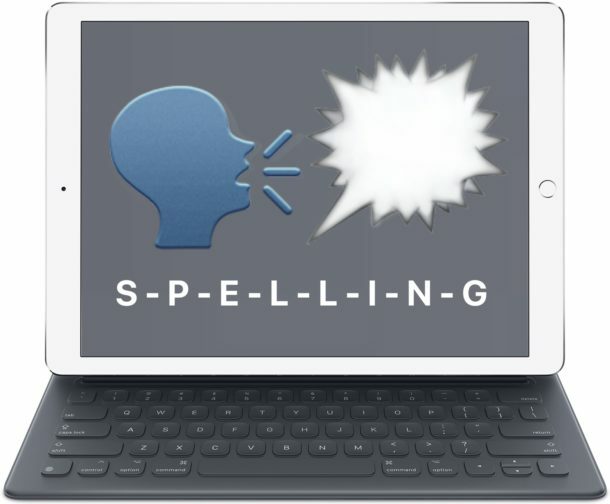 Do you know of any similar interesting or worthwhile spelling or speech tricks for the iPhone or iPad? Share with us in the comments below! Do we need to activate something specific in settings>general>accessibility? because I can’t get this to work on my 2nd gen ipad pro. When I select text, all I get is cut, copy, look up and share. There is no “spell” option in the menu. I found the cause of the problem. For the tip above to work, the “Speak Selection” toggle switch under settings>general>accessibility>speech must be set to ON (green). Otherwise, when selecting text, the menu will only show the options to copy, look up and share (and also cut if the selected text is editable). The article should have mentioned this requirement. I got it to work. Problem was that the article did not mention that, for the menu ti display the ‘spell’ command, the “speak selection” toggle switch under settings>general>accessibility>speech needs to be set to on (green). Otherwise, the menu will only show the standard commands such as cut (for editable text only), copy, look up and share. I don’t get a spell option either. iPad one year old, latest iOS installed. But I didn’t set up Siri. Now I know why we didn’t get it. For the spell option to appear, the ‘speak selection’ toggle switch in settings>general>accessibility>speech needs to be activated. The article should have included this information. Thank you for taking the time to respond to us. Exactly, and the article should have included that warning since the toggle switch is off by default. I figured it out right after I posted my original comment and wrote another comment to point it out and make note of the omission in the article, but that one was sent to moderation for some strange reason. That’s a different spelling feature than the one described in this article, but thanks for the tip. It’s good to know that we can also ask Siri to spell a word, and not only on the HomePod, but also on every other device where Siri is available such as the iPhone, iPad, iPod touch and even the Mac. Thanks for the tip, but that’s a different feature through Siri. Nonetheless, it’s good to know that we can also ask Siri to spell for us. BTW asking Siri to spell works on all devices that have Siri such as iPhone, iPad, iPod touch or even a Mac, not just the HomePod. I know that Siri is great for texting and sending messages while I am driving and I was just wondering is there a way to get punctuation marks while using Siri. Semantic alert – “annunciating” should be “enunciating”. It’s not announcing, it’s pronouncing the word, letter by letter. Plus two Airports and so going every night and every day.